Ballina Dramatic Society is set to make a welcome return to the stage on Thursday, Friday and Saturday, April 11, 12 and 13 next with its latest production. Welcome to the Stranger sees this talented amateur dramatic group continue an unprecedented track record of innovation that began in 2012 when it staged Names Upon the Water — an epic adaptation of the true story of the Addergoole 14, a group of parishioners from the Lahardane area that sailed on the Titanic’s tragic voyage. The following year the society teamed with a new playwright to premiere Waiting for God Only Knows What. Since then the group has returned to the drama festival circuit to entertain audiences with a mix of farce, period productions and hard-hitting Irish favourites. In early autumn, a unique challenge presented itself to the society, courtesy of new member Tanya Flynn, when they were afforded the opportunity to collaborate with the Cork-based playwright Rua Breathnach and Belgian director, Rémy Beelprez to stage Welcome to the Stranger. This contemporary piece of theatre about the Great Famine is based on historical records but relayed through a very different approach including the undertaking of rehearsals in blocks of five days and/or via Skype; taking on several roles and working with an external director and a moving set. Ballina Dramatic Society is relishing every minute of the challenge. Featuring a cast ranging in age from seven to 70 years and numerous new faces, Welcome to the Stranger centres around American writer and philanthropist, Asenath Hatch Nicholson. She was the proprietor of a New York boarding house where she met many Irish emigrants fleeing their famine-ravished homeland. In 1844, this progressive, brave woman crossed the Atlantic to witness the conditions in Ireland at first-hand. She documented her experiences in her journals. 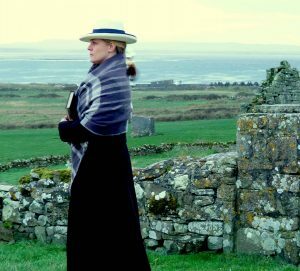 When she arrived in north Mayo, Asenath was faced with unparalleled poverty and, haunted by the scenes she witnessed, returned to that area again in the cruel winter of 1847 when the Famine was at its peak, doing everything she could to alleviate the suffering of the ordinary people. In Welcome to the Stranger, Rua Breathnach cleverly weaves this factual historical account of the Famine into a sequence of scenes that explores the complexity of Irish society during that era, affording a graphic insight into the conditions that prevailed through the eyes of the real people that Asenath encountered on her journey. Ballina Dramatic Society’s staging of Welcome to the Stranger presents an ideal opportunity for locals and students to experience Asenath’s unique perspective on this tragic era. The production will also be staged in Westport’s Town Hall Theatre for one night only on Friday, April 19. Demand is expected to be high so early booking is advisable. Contact Ballina Arts Centre on 096-73593 or book online, www.ballina artscentre.com. Bookings for the Westport show can be made via 098-28459 or by emailing [email protected] com. Carmel Tuffy plays the role of Asenath Hatch Nicholson an American woman who travelled around Ireland during the Great Famine and recorded the horrific suffering of the people in her journal which forms the basis the Ballina Dramatic Society’s latest production, “Welcome to the Stranger”.